Towards the end of last season, along with several club directors, staff members and many other Brentford supporters I was interviewed so that I could express my own feelings and sentiments regarding the football club. What did it mean to me? What made it stand out? 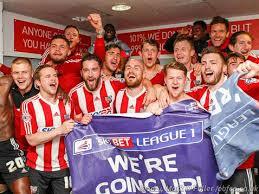 Why did I continue to support the club and return week after week to the shrine that is Griffin Park? What was special and unique about Brentford? There was also a lot of discussion about the Brentford brand and what it stood for. As the fan base continues to grow and more and more people begin to take an interest in Brentford, was the club being introduced and presented to supporters, both new and old, in the right way? What values best personified the club looking pack to the past as well as now, in the present, and most importantly,to what extent would these remain the same in the future? How could the club retain its traditional positive character traits and not alienate long term supporters yet still remain relevant and contemporary to the younger fans now being attracted to the club by virtue of its recent success and growing reputation for playing vibrant attacking football? A lot of work was conducted by the club who then drilled down even further through a series of online questionnaires to season ticket holders and members and finally a working party was established with a group of fans of all ages and backgrounds who analysed and reviewed the initial findings and acted as one last sounding board. The salient points and learnings from this research project will, I am sure, become evident over the coming months by virtue of changes and ideally improvements in how the club presents its public face through communication channels such as its website and all areas of social media and, on Tuesday, as a first step the club released a brand new video which allowed fans of all ages to tell their own stories about Brentford, what it means to them, their mood regarding the current state of the club and how they felt about the immediate future. It can be found on the Brentford website and I commend it to you all as it is three minutes and forty-five seconds of pure gold dust which made the hair stand up on the back of my neck, and I have to say it also gave me goosebumps. It is a truly excellent piece of work which is evocative, pulls at the heart strings but is also confident and forward thinking and it has accurately portrayed what the Brentford brand represents, retrospectively, in the present, and ideally, moving forward. Through a series of short sharp vox pops it clearly communicates the values of the club and helps to explain what makes us different and unique. Brentford surely means different things to every supporter but each and every interview had one thing in common that clearly shone through – a feeling of unity and belonging. We are all in this together as one extended family and there is not the dissonance and void that exists in many bigger clubs where there is a clear separation and divide and a feeling of them and us. Brentford is part of and serves a vibrant local community and must never lose sight of that fact and however high we rise in the football food chain, we cannot fall into the trap of becoming a soulless, amorphous and clinical conglomerate. The intimacy, charm and, frankly, ramshackle nature of Griffin Park is the glue that binds us all together and Lionel Road must, and surely will, replicate that sense of warmth and togetherness. I am sure that all these words will make you feel just as proud and emotional as they did me when I first watched the video. The club is to be commended and has done an excellent job in capturing the mood and spirit of its supporters and I feel proud of our past, delighted about the present and confident about the future. It’s OK, you can all breathe more easily now – you didn’t dream it and it wasn’t a fantasy! It’s absolutely true – we really ARE going up! Last season was so incredible, enjoyable and fantastic that sometimes I find it hard to accept that it really happened. As a tried and tested Brentford fan of many years’ vintage I am reconciled and inured to things going wrong. I have come to expect the Gods to look down and laugh at us and shatter our hopes and expectations. There are far too many examples over the recent years of us choking and blowing it and seizing defeat from the very jaws of achievement and success. You really don’t need me to rehash them for you now. Those horrid, negative expressions “It’s Brentford Innit” and “It’s the hope that kills you” have ruled the roost at Griffin Park for far too long and become self-perpetuating prophecies. Last season proved that we can dispense with this negativity once and for all. Because with a lot of hard work, a clear strategy, highly talented personnel throughout all departments of the club and the support and vision of owner Matthew Benham we have become an amazingly well run, organised and structured club that has laid the correct foundations from bottom to top. Given these circumstances you actually make your own luck and last season proved that we are now a force to reckon with and perhaps the best is yet to come. All of the above is reinforced by the Brentford promotion DVD “We’re Going Up!” which provides a suitable and appropriate high quality record of the best season in my living memory. The promotion season of 1992 was highly memorable and we actually won the League that season on the back of an incredible forward line but that team never came close to matching the quality of the football that the 2014 team exhibited on an almost weekly basis. The DVD has immaculate production values and a decent professional commentary – far better than my own stuttering efforts of a few years ago! Every game, home and away, is featured with the goals, near misses and other incidents of interest. You can revel once again in all of the goals we scored and my Top Ten quickly became a Top Twenty-Five. How can you possibly choose between the long range Exocets of Alan Judge, Kadeem Harris, George Saville and Adam Forshaw; Marcello Trotta’s trickery and quick feet; Clayton Donaldson’s power and strength and the many examples of high quality, pacy interchanges where the team turned defence into attack in the blink of an eye? The contentious moments are all featured and Toumani’s disallowed goal against Carlisle still looks like an abject decision by an awful referee. There is also Jonathan Douglas’s moment of high comedy and high dudgeon with that bounce up after the penalty that never was at Sheffield United. It’s all there so sit back and enjoy it once again. The commentary doesn’t pull punches either with a certain Brentford goalkeeper’s faux pas at Stevenage aptly described as a “moment of madness”. A few minor quibbles: I would love to have been reminded of Tony Craig’s “Five-On-One” where, like Horatius at the Bridge, he singlehandedly repulsed the five Oldham attackers and Sam Saunders’s comic cuts slip and devastating recovery against Swindon was also omitted. I also conducted what in the trade they call a ‘”focus group” where a couple of my Premiership team supporting mates came round the other night ostensibly to watch the World Cup. Bribed and liberally plied with alcohol, they agreed to forgo the dubious pleasure of Brazil v Chile and were instead treated to twenty minutes worth of Brentford at their best. “Can I come and see them with you next season” were just some of their comments. Proof indeed that the tom toms are sounding loud and clear and others are also finally beginning to recognise and acknowledge our progress and prowess. Brentford FC are on the crest of a wave at the moment and this DVD provides a worthy record of these incredible times. It is a bargain at £14.99!